UPDATE February 10, 2014: Mt. Province Cable Tours franchise was sold to GV FLorida for the routes Manila to Bontoc and Manila to Sagada. One of the buses figured figured in an accident on February 7, 2014 which killed about 16 people including Arvin "Tado" Jimenez (of unTV Strangebrew TV show and 99.5 RT radio show Brewrats with Angel Rivero and Ramon Bautista). For other people looking for the same information on Cable Tours, Tutubi was able to take a drive-by photo of the unassuming terminal of cable tours on E. Rodriguez St in Quezon City a few months ago. From MRT Araneta-Cubao station or LRT 2 Cubao Station, twalk towards Aurora Blvd then board a jeepney bound for Manila. Note: Cable Tours buses don't directly take you to Sagada but only to Bontoc. You need to take another 45-minute jeepney ride to Sagada (fare: P40.00) to get there. No information on Cable tours official website, safety records and accidents (if there are), chartered bus rates as of posting time. also with Manila to Bontoc daily trips at 9pm and Bontoc to Manila return trips at 4pm. This is a very helpful post. The way the sign of Cable tours is hidden, obviously you can't find any information or contact details about their business elsewhere (in the Internet). I will be going to Sagada Jan. 19 for 5 days, you mentioned in your blog that accomodation reservation is not necessary, have you done any homestay in Batad Kadangyan Lodges? Any information you can fwd me would be appreciated. hi! do you know if cable tours is still operating? been trying to contact the numbers here in your site but i guess its not working.. planning to go to sagada this friday and im checking other options>> thanx in advance! Cable tours is operating but it is now located behind the Shakey's next to Trinity Uni of Asia. 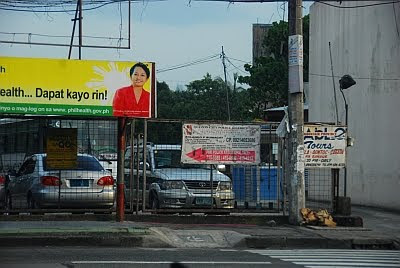 If you take the road between Shakey's and Trinity, you will see it on the right side. If you get to the gate, you went to far. Reservations are recommended. Note, this is a VERY old bus. Very tight fit but good driver. Also note, they have VERY strong air con that they will use even in the mountains to bring some coats and blankets. is there any contact no. preferably landlines we will go to bontco this april 4 2012..... thanks! Thanks for this info. Me and my friends will be visiting Sagada in November!